Special education teacher Edward Singleton said he spent nearly a decade saving for the $20,000 deposit he put down on a home he contracted to buy in Loudoun County, Virginia. But he broke down in tears when he explained how he’s spent the past four years fighting to get his life savings back after he lost both the $20,000 deposit and the home. "I need a lot of help," Singleton said. "Because it doesn’t make any sense." Real estate agent and grandmother Tarshia Brown lost $52,000 when she put the money down to buy a house in Prince George's County, Maryland. "That $52,000 could have put my daughter through college. It could have put my son through college," she said. Singleton and Brown tried to buy their homes from Toll Brothers, which describes itself on its website as "America’s leading luxury home builder." Federal mortgage data shows Toll Brothers sells more homes here in the D.C., Maryland and Virginia region than anywhere else. It also owns its own mortgage company, TBI Mortgage. Singleton and Brown said they could have used another lender but decided to go with TBI because they were promised free upgrades. Brown explained, "If you do not contract or take their mortgage lender, you lose all the goodies. So you lose the chef's kitchen. You lose the finished basement. You lose whatever they’re offering in closing." But after signing contracts, Brown and Singleton were told they no longer qualified for their original financing offer. Instead, they said Toll Brothers offered them loans they couldn’t afford or no loan at all, meaning they lost their dream home and their down payment. "I was told that my debt-to-income ratio was too high," Singleton said. "After I signed the check." Singleton and Brown said they were never pre-approved for a loan, and the News 4 I-Team found they're not alone. According to federal mortgage data compiled under the Home Mortgage Disclosure Act, TBI hasn't pre-approved a loan in the last five reported years. But the company's financial statements to the U.S. Securities and Exchange Commission show it reported more than $125 million in revenue since 2006 by seizing down payments from cancelled contracts. A 2011 class-action lawsuit filed against the company in Maryland even alleged Toll Brothers made more money canceling contracts than selling houses after the housing market collapsed. Toll Brothers settled that lawsuit, but neither side would comment on the terms of the settlement. In a statement, Toll Brothers told the News4 I-Team, "In each of these instances, we retained the original buyer's deposit to mitigate the actual losses we incurred" but "only after many attempts to work with those buyers to save their deals. Ultimately, the retained deposits were not enough to cover those losses." 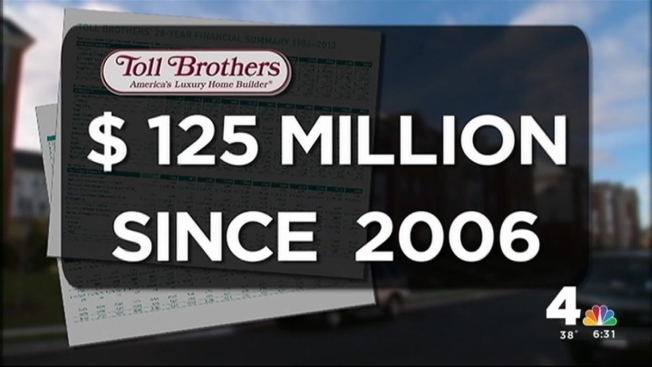 Toll Brothers also said the revenue from those deposits were "gross amounts [that] do not reflect the losses that the company actually sustained." "A Little Rough on Consumers"
Pennsylvania-based real estate lawyer Jim Tupitza told the News4 I-Team he sees cases like this "all the time" -- customers who think a Toll Brothers contract will allow them to recover their down payments if they can't get a mortgage or close on their home, when that's not actually the case. Tupitza said it all boils down to the "Mortgage Application" paragraph of the Toll Brothers contract, which he said is one of the most confusing contracts in the business. "If you read it," said Tupitza, "you will think it says one thing. But if you diagram the sentence like you learned in high school English, you'll realize it doesn't say that at all." "I think it's a little rough on consumers," Tupitza said. In its statement, Toll Brothers said, "Our success drives from selling homes to buyers who actually close, not retaining deposits from people who don't," and "...we commit valuable land and invest hundreds of thousands of dollars and resources" into its custom homes. Tupitza said he’s gotten down payments back for his clients. But the legal process, which must go through arbitration according to the Toll Brothers contract, can also be just as costly. "My client blew through $45,000 in legal fees," Tupitza told News4, "to get back about $40,000 in deposits." Both Edward Singleton and Tarshia Brown have contacted their local governments in hopes of getting their down payments back. Jim Tupitza said whether seeking a home with Toll Brothers or any custom builder, buyers should always seek legal advice first. He also said securing the mortgage before signing a contract, or even walking into a sales office, is key. "You're making the biggest investment you will ever make in your life," Tupitza said. "And you're stepping near the biggest mistake you could make in your life."